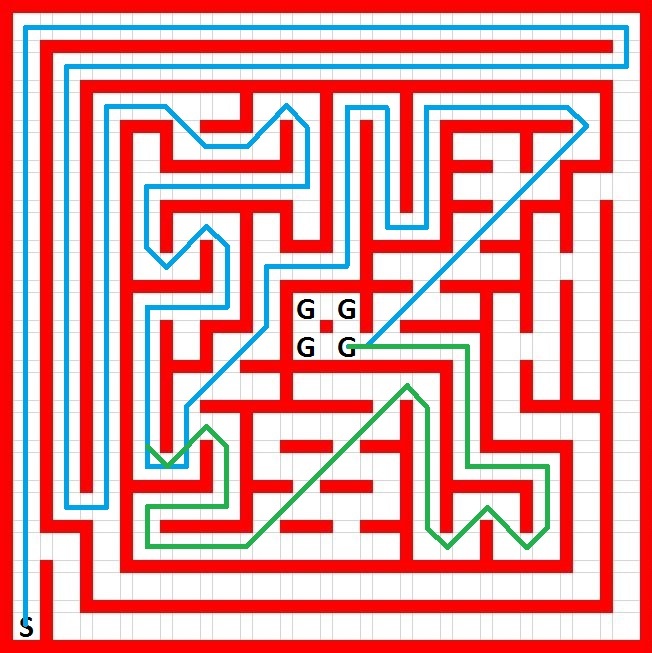 The image above is the maze for this competition, and there were typically 2 paths for speed runs, Marked in Blue and Green. If the mouse successfully made search on the way to center and the way back to the starting corner at least once, the blue path will be found no matter it is straight oriented or diagonal oriented algorithm. Both paths have exactly same number of cells. Based on the scores of top 5 Mice at APEC this year, seems the blue one is faster. As we can see, the Blue path has less theoretical overall path length. Besides, the diagonal straight cells for Green path(13 cells of distance) is rather separate for acceleration than the Blue path(16 cells of distance). Unfortunately, my mouse chose the Green path starting from the 3rd run(2nd speed run). I think it is time to update my path generator program. The 1st and 2nd places Mice were all choosing the Blue Path. Click the image above to get a more detailed view. As always, the top 3 places are determined by ‘Best Score’ instead of ‘Fastest Run’. Here is the link for Program, a brief introduction for each mouse at APEC 2016.